If you have a lot of people all going to the same place, and every couple of them take their own car or SUV, and you add up all the gallons of gas used and divide that into the trip distance in miles – that calculated number would be a ridiculously low miles to gallon ratio! In addition, if you deducted all the fun stories and jokes, reminiscing and engaging conversations that only happens when you have everyone together for the ride in the same vehicle – that calculated number would be a ridiculously low fun to the mile ratio! And furthermore, if you added in the tiredness factor, the reading the map or programming the GPS factor, the road weary factor, and times it by the number of people in your group – that calculated number would be a ridiculously high number of exhaustion! And going one bend beyond, if you figured out the wear and tear on your car’s components, tires and brakes, and the potential for pushing the limits of a lease mileage total, or depreciation of an owned vehicle – that calculated number would be higher than the cost of a really nice dinner once arriving at your desired destination. A while ago we designed this graphic comparing one bus to fifty cars. You will be surprised at the efficiency of getting your group on a luxurious charter. Everyone is all in one place, relaxing and enjoying the ride and the scenery. AND everyone on board is contributing to going GREEN! Far less fuel consumption, greatly reduced CO2 into the atmosphere. Less cars on the road too! We only have ONE planet. We have to try to make it last – for us now and for future generations. 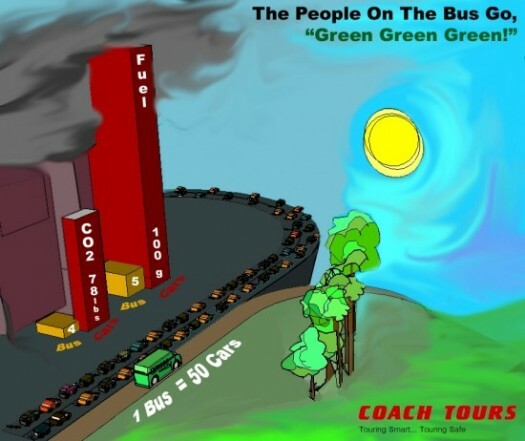 Taking a tour bus to your desired destinations is a great way to contribute to going Green. It also sets a good example to the kids on board, and hey, they will have fun with the other ones on board. Modern buses are not like ones from yesteryear. They are CUSHY COMFORTABLE. Quite and with lots of amenities. And don’t forget the driver! A professional that gets you and your party there safely and easily. You rest – they drive. When your group arrives, all are ready to go. The trip was fun. The company was great. …and you wonder why you never did it this way before!